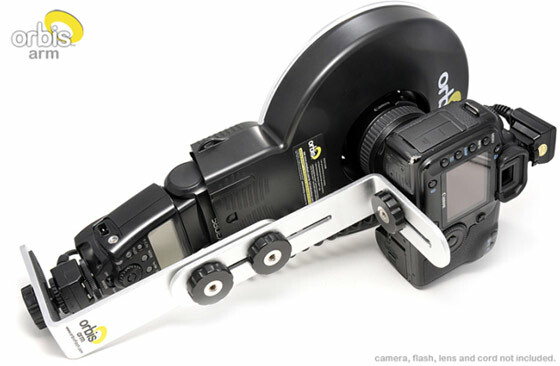 The orbis arm is an invaluable mounting bracket that makes the orbis even more versatile. By handholding the orbis you can easily achieve a shadowless, beautiful ring flash effect, or take it off-lens to create a variety of lighting set-ups in moments. But some photographers love shooting exclusively with the orbis on-lens for longer. The orbis arm provides a solid mount for photographers who want to use their orbis in its primary ‘ring flash’ position for extended shoots. With the arm you can also easily mount the system on a tripod without using an extra light-stand. The orbis arm is a compact and lightweight mounting bracket designed to work with the orbis ring flash and most of your favourite SLR flashes, cameras and lenses. Built from 6061 aircraft grade aluminium and finished in a smooth powdered silver, the arm extends the possibilities of your orbis, giving you the freedom to shoot on-lens for longer! Posted: November 13th, 2009 under News, Products.